The space underneath our TVs is getting pretty cramped as we add various boxes to enjoy our media. Set top boxes jostle with Blu-ray players, consoles and DVRs. This is why the Roku LT is a breath of fresh air - its tiny body means that it can easily fit near your TV to stream media from services such as BBC iPlayer and Netflix. Simplicity is the Roku LT's game, with no on/off switch. This means it's permanently on, but Roku assures us that it only draws the same amount of power as a nightlight, so you shouldn't be stung by any huge electricity bills. 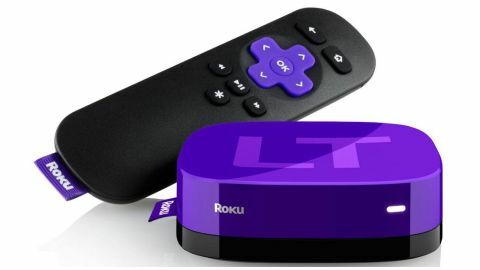 The remote is almost as streamlined as the box itself, with the minimum of buttons for selecting the services and navigating the Roku LT's menus. Because of the simple remote, entering your Wi-Fi password can be a bit frustrating, but once done you can begin streaming videos and music. The Roku LT can handle 720p video, which is good but not the highest resolution we've seen. And it comes with an HDMI port, but no HDMI cable - you'll need to buy one separately. It does come with composite AV cables, however. While BBC iPlayer is present and correct, there's no ITV Player, 4oD or other TV catchup services, and if you stream films via Lovefilm rather than Netflix, then you'll be out of luck for the time being. The Roku LT should be updated regularly, so we hope for some more channels in the future. The Roku LT is a nicely designed product, but a bit too simple.